PARTNERS: Hiroshima’s Gov. 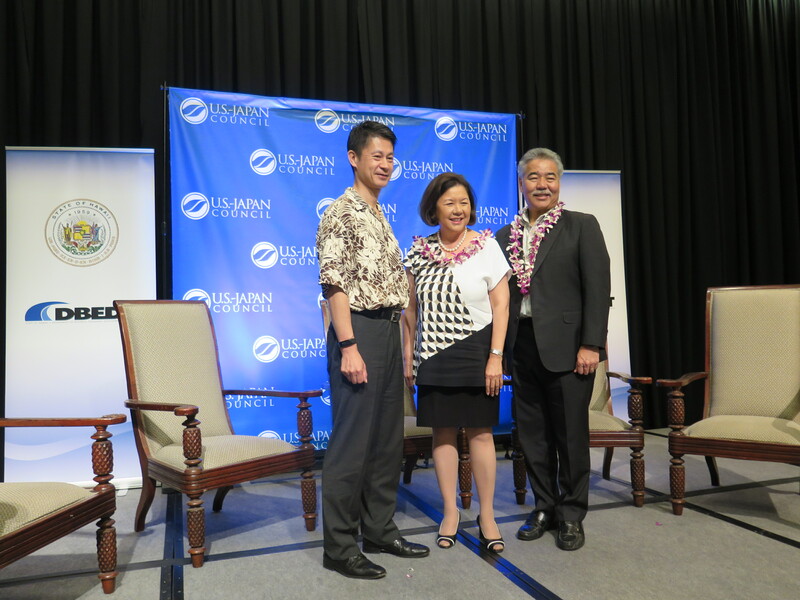 Hidehiko Yuzaki, USJC President Irene Hirano Inouye and Gov. Ige. If you’re a Hawai‘i small business owner like Isabella Hughes and Harrison Rice, you know you need all the friends you can get. But what if that friend was the state’s Department of Business, Economic Development and Tourism (DBEDT)? And what if they told you they could help you leverage your business globally — in Japan and other markets? 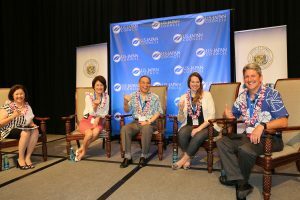 That global connection and the state’s strong ties to Japan took center stage in Kona last month for the inaugural Japan-Hawai‘i Economic Summit, sponsored by the U.S.–Japan Council (USJC) and DBEDT. 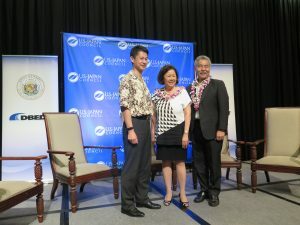 The conference attracted a VIP list of 200, including governors, vice-governors and business leaders from Japan as well as community leaders from Hawai‘i. GLOBAL THINKERS: USJC President Irene Hirano Inouye, First lady Dawn-Amano Ige, Hiroshima superintendent Kuniaki Shimozaki, Kizuma Across Cultures VP Shanti Shoji and UH president David Lassner. DBEDT director Luis Salaveria described the summit as “a tremendous success with a lot positive feedback from participants. Hawai‘i has such a strong brand in Japan; we’re treated on a par with other countries. Japan is our biggest tourist and international student market. We’re excited that future summits can help us find new ways to connect,” he said. TOKYO SHOWCASE: Shaka Tea owners Harrison Rice and Bella Hat the Tokyo Gift Show with DBEDT director Luis Salaveria and their translator. 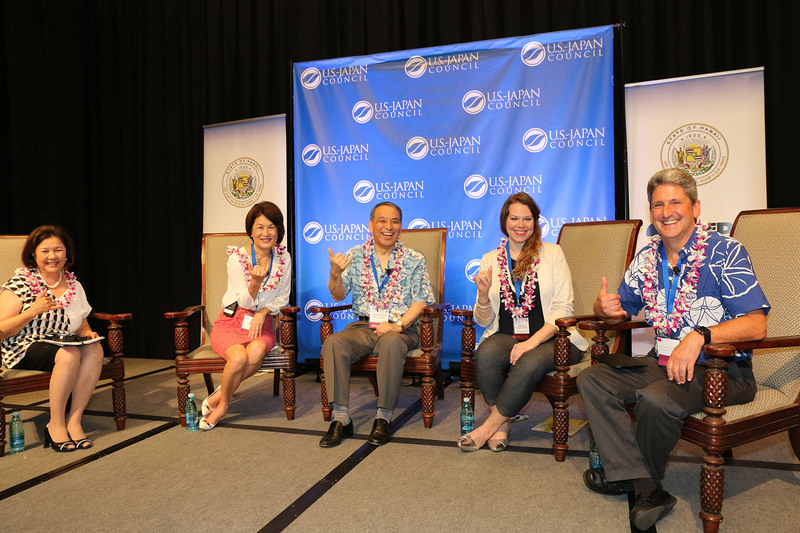 One of DBEDT’s most promising programs involves helping small and medium-size Hawai‘i businesses gain a foothold in the Japan market as well as showcase the state. 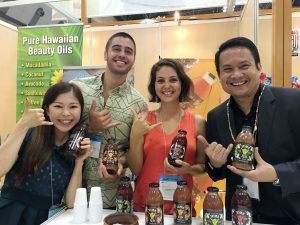 Through events such as the annual Tokyo International Gift Show — the largest international trade show in Japan — local entrepreneurs such as Shaka Tea owners Hughes and Rice gained visibility for their product and potential new investors. To prepare for the Tokyo show, they participated in HISTEP, a DBEDT and the Small Business Administration program to help small businesses with export development. 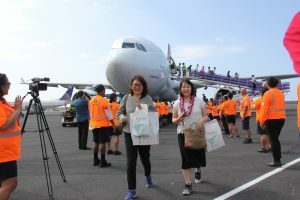 “Last year HISTEP provided financial assistance to 58 companies and organized Hawai‘i Pavilions for 179 participants, leading to sales of more than $32.5 million,” said Dennis Ling from the Business Development Branch. This fall DBEDT will be taking 70 local companies to the Tokyo expo to showcase Hawai‘i products. 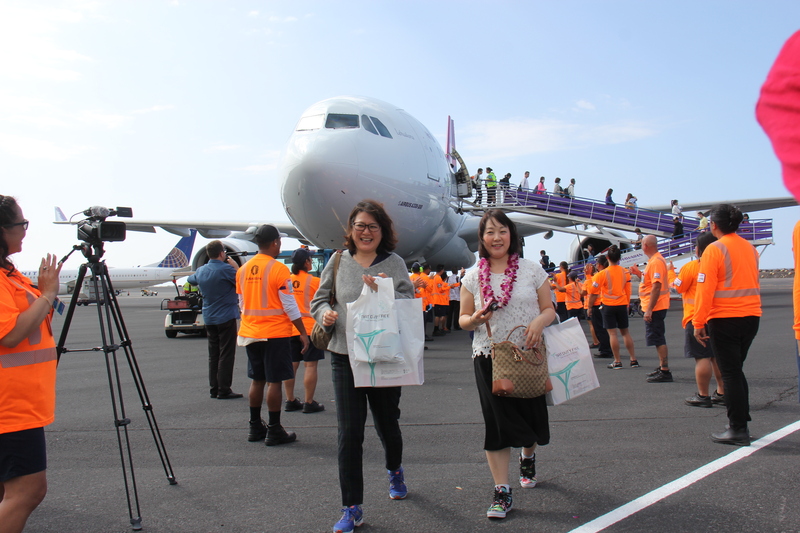 TOURISM AND BEYOND: Japanese visitors arrive at Kona International Airport. • Visitors from Japan make up the state’s No. 1 international tourism market, numbering nearly 1.5 million in 2016. Tourism accounts for more than 20 percent of the state’s economy. • Japan was the source of the most international students in Hawai‘i in 2015-2016 — 4,297 or 35.2 percent. • Hawai‘i has 16 sister-state relationships, including provinces or prefectures in Japan, China, Taiwan, Korea, and the Philippines.